In the applet below, using the filling slider to make the parallelogram shown light enough so that you can see the white gridlines through it. (Don't touch anything else yet!) After you set the filling slider, try to count the number of squares inside this parallelogram. Be sure to include partial squares! Provide a good estimate in the question box below. How many squares (i.e. square units) do you see in this parallelogram below? Slide the "Slide Me" slider now. Carefully observe what happens. What shape do you see now? How does the area of this new shape compare with the area of the original parallelogram? How do you know this? How many squares do you now count in the newer shape that was formed? How many squares were in the original parallelogram? 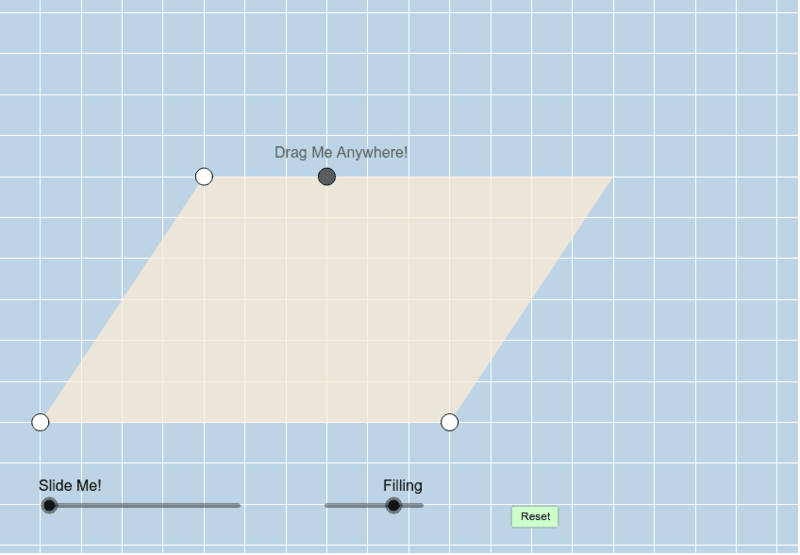 Without looking it up on another tab in your browser, describe how we can find the area of ANY PARALLELOGRAM.